I'm in love with Charlie!!! I truly believe this is one of my favorite Charlie sets that have been released so far. I know we all love Charlie/Charliene but how fun is he/she in this set, Charlie Summer Fun, available on July 1st from Clear Dollar Stamps. I've been trying to stretch myself creatively lately and go for something different. For my first card, I was inspired by a wooden picture frame that I found at Michael's that I thought would be fantastic to cover with DP, add Charlie and be done. Well lets just say - that a picture frame was harmed in the making of this card. The DP wasn't going on right, the frame was looking bad. So ultimately I pried it apart (this was not an easy task and involved a few splinters) and used the palm tree portion of the frame as a template for my palm tree. I used Chocolate Chip paper and ran it through my Cuttlebug with the Forest Branches folder and then sponged it to give it a more realistic route. I stole (err... borrowed) some sandpaper from my parents house - they had a couple boxes full- do you really think they'll miss a couple pieces? Like my buttons that I used as the sun? Charliene was colored using my Tombows and then cut out. This card also satisfies a challenge the DT had to use no ribbon. So super fun and cute. The sand looks awesome! Fantastic cards Angela. 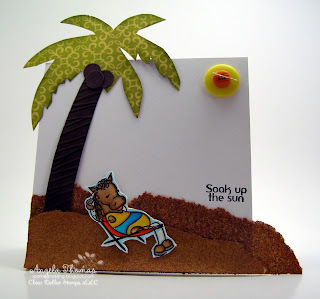 I love the palm tree with Charlie and just look at that DP and border layers on the second card. Terrific job. I love the dimension that all the layers create on both cards. Fantastically done! Really cute cards Angela, I love the "sun" and the colors on your Larkspur are beautiful. Ohhh, these are way too CUTE! WOW!!! Your coloring on that adorable Charlie is FABULOUS!!!! 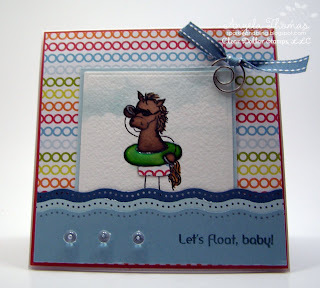 The palm tree is adorable, too, and I love how you did the waves on the second card!! !